Our team works day-in and day-out to bring you the hottest rave eyewear on the planet. This frame is straight out of 1980 with a Miami Beach style and geometric Aztec pattern. Our exclusive Aztec-Print Kaleidoscope Glasses are a GloFX favorite and were hand designed and printed onto our durable plastic glasses frame. We matched our Aztec frame to our Kaleidoscopic Rainbow Wormhole lenses to develop a variety of styles for these rave glasses. The real glass crystals are faceted for an intense experience that you cannot find anywhere else, and our Wormhole version offers a clean center for visual stability. Each pair includes a free microfiber cleaning case and are painstakingly made by hand, assuring that each pair of glasses is of the highest quality. Don’t settle for less. 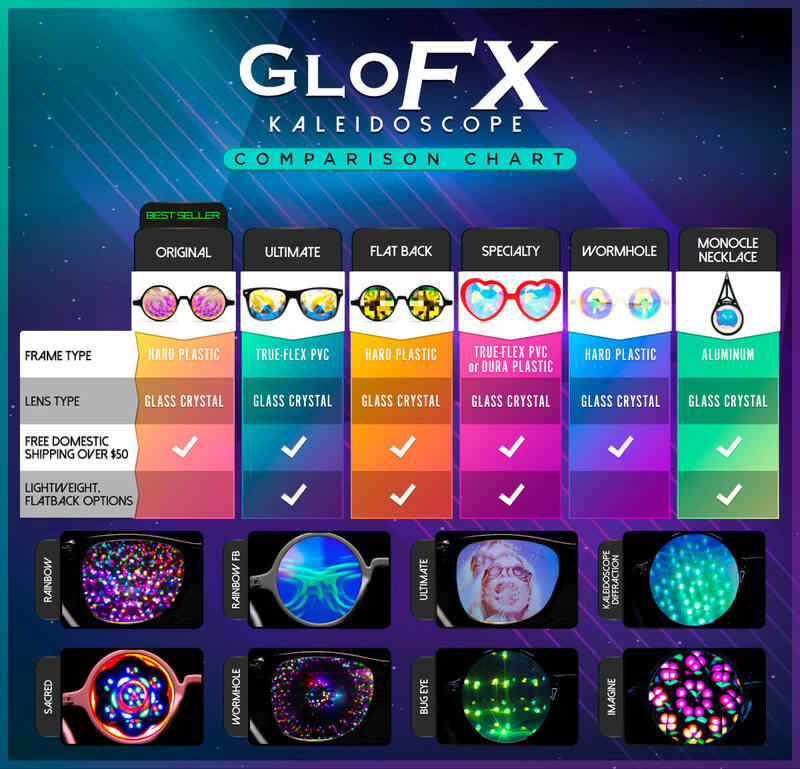 Swag up for your next EDM Festival in a pair of our Kaleidoscope Glasses! THE COOLEST glasses I’ve ever owned. They were a lot heavier than I thought (aka I wouldn’t be able to constantly wear them at a festival which they were intended for) but overall they were perfect. If you want high quality diffraction glasses that are cute, this is the winner.